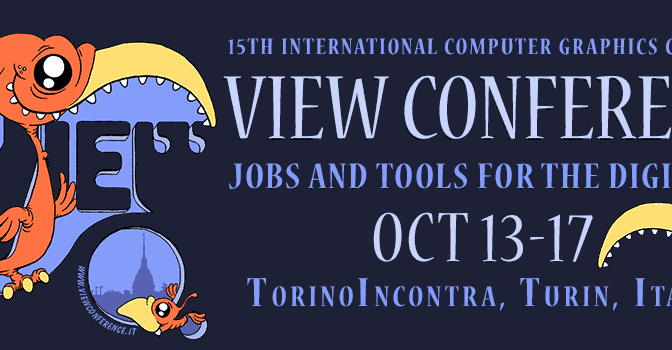 TURIN, ITALY – Attendees at Italy’s largest computer graphics conference to be held October 14-17 in beautiful Turin, Italy, can now register online at http://viewconference.it/ for the full conference, for inspiring and creative workshops led by award-winning professionals, and for practical master classes taught by expert users. In addition to the workshops, Coleman, Schaub, Modesto, and Bakker Harger join other award-winning speakers throughout the week who will share information about their studios’ work on the major visual effects and animated feature films of 2014, videogames, virtual reality, and other exciting areas of computer graphics. Keynoting the VIEW conference are award-winning director, writer, producer and actor Tom McGrath from DreamWorks Animation, artist, inventor, author, entrepreneur and Pixar-co-founder Alvy Ray Smith, and award-winning legendary animator Glen Keane. – Lighting supervisor and VES award winner Alessandro Jacomini from Disney Animation Studios will give a world premiere talk on Big Hero 6, which releases November 7 in the US and December 25 in Italy. – Providing an early look at the 2016 Smurfs film are production designer Noëlle Triaureau and two-time Annie award nominee art director Marcelo Vignali from Sony Pictures Animation. – Co-head of story at DreamWorks Animation and two-time Annie award nominee Alessandro Carloni will present How to Train Your Dragon 2. – Supervising production designer, Emmy award winner and two-time Annie award nominee Nelson Lowry from Laika will introduce the stop frame world of The Boxtrolls. – Technical Supervisor, Bill Watral from Pixar will present the latest Pixar short LAVA. – Jerome Solomon, academic dean at Cogswell College and a SIGGRAPH national committee member, will show this year’s selections of the best in computer graphics from SIGGRAPH’s Electronic Theater. – Industrial Light & Magic’s Scott Farrar, who has received an Oscar, six Oscar nominations, four BAFTA nominations, four VES nominations, and two VES awards, will speak on Transformers 4, for which he was visual effects supervisor and second unit director. – VFX supervisor Keith Miller from Weta Digital, a BAFTA nominee and three-time VES nominee, will present work from Dawn of the Planet of the Apes. – VFX supervisor Kyle McCulloch, a two-time VES award nominee and VES award winner, will talk about Framestore’s work on Guardians of the Galaxy. – Animation supervisor Tim Harrington will talk about Industrial Light & Magic’s work on Teenage Mutant Ninja Turtles. – Visual effects supervisor Stefen Fangmeier, who has three Oscar nominations, four BAFTA nominations, three BAFTA awards, and a VES nomination, and Merzin Tavaria, chief creative director at Prime Focus World, will present the visual effects in Sin City: A Dame to Kill For. In addition, speakers from the worlds of game development, virtual reality, motion capture, and medicine include: Parag Havaldar, R & D Lead at Blizzard Entertainment. David Putrino from Not Impossible Labs at Weill-Cornell Medical College. Flávio Andaló and Milton Luiz Horn Vieira from the DesignLab at UFSC. Elisa Di Lorenzo from Untold Games. Pierre-Alain Gagne from DOWiNO. Philip Stevju Løken from Placebo Effects. Kim Baumann Larsen from Digital Storytelling.